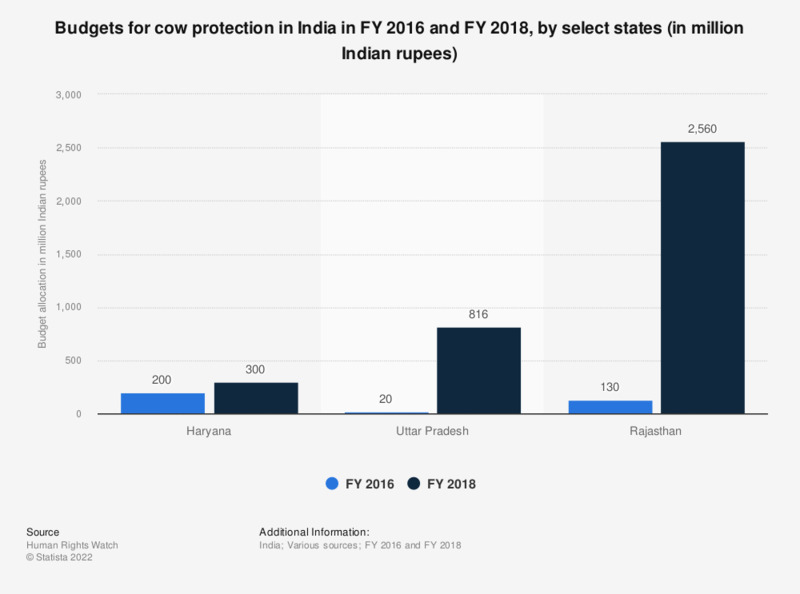 This statistic shows the budget values for cow protection by three states in India for fiscal years 2016 and 2018. As seen in the graph, the budgets for cow protection rose drastically for all three states from fiscal year 2016 to fiscal year 2018. The state of Rajasthan saw an exponential rise in the budget dedicated for cow protection with over 2.5 billion Indian rupees allocated in fiscal year 2018 compared to the 130 million rupees in fiscal year 2016. Cow slaughter is forbidden in most parts of Hindu-majority India. However, since Prime Minister Narendra Modi came to power in 2014, Hindu nationalists have led a political campaign to enforce a ban on cow slaughter and stop cattle smuggling. This has led to an increase in cow vigilantism (known as "gau-rakshak"). The government has also been accused of obfuscating data on cow smuggling in order to maintain a demand for continued cow vigilance. Note: One Indian rupee is equal to 0.014 U.S. dollars and 0.012 euros as of March 2019.